Emotional Congruence in Video Game Audio. Williams, D., Cowling, P.I, Murphy, D.T., in Encyclopedia of Computer Graphics and Games (ECCG). New York: Springer, 2019. Emotion in Video Game Soundtracking. Duncan Williams and Newton Lee. International Series on Computer Entertainment and Media Technology. New York: Springer, 2018. BCI for Music Making: Then, Now, and Next. Duncan Williams and Eduardo Miranda. In Brain-Computer Interfaces Handbook: Technological and Theoretical Advances, Ch.10, pp191-205. Eds C.S. Nam, A. Nijholt, F. Lotte. CRC Press, Taylor & Francis Group, Jan 26, 2018. Creative Music Neurotechnology with Symphony of Minds Listening. Eduardo Miranda, Dan Lloyd, Zoran Josipovic, Duncan Williams., in Guide to Brain-Computer Music Interfacing pp.271-295. Eds. Eduardo R. Miranda, Julien Castet. New York: Springer, 2014. Directed motor-auditory EEG connectivity is modulated by music tempo. Nicolaou, Nicoletta; Malik, Asad; Daly, Ian; Weaver, James; Hwang, Faustina; Kirke, Alexis; Roesch, Etienne; Williams, Duncan; Miranda, Eduardo Reck; Nasuto, Slawomir. Frontiers in Human Neuroscience, 2017. The Space Between Us: Evaluating a multi-user affective brain-computer music interface. Eaton, J; Williams, D; Miranda, E. (2015). Brain Computer Interfaces, Taylor and Francis, Volume 2:2-3. pp.103-116. Music-induced emotions can be predicted from a combination of brain activity and acoustic features. Daly, Ian; Williams, Duncan; Hallowell, James; Hwang, Faustina; Kirke, Alexis; Malik, Asad; Weaver, James; Miranda, Eduardo; Nasuto, Slawomir. (2015). Brain and Cognition, Elsevier, Volume 101. pp.1-11. Investigating Perceived Emotional Correlates of Rhythmic Density in Algorithmic Music Composition. Williams, Duncan; Kirke, Alexis; Miranda, Eduardo; Daly, Ian; Hallowell, James; Weaver, James; Malik, Asad; Roesch, Etienne; Hwang, Faustina; Nasuto, Slawomir. (2015). Transactions on Applied Perception, ACM, Volume 12:3. Artificial Intelligence in Organised Sound. Miranda, E. R., Williams, D., (2015, April). Organised Sound, 20:1, pp 76-81. Cambridge University Press. Investigating affect in algorithmic composition systems. Williams, D., Kirke, A., Miranda, E. R., Roesch, E., Daly, I., & Nasuto, S. J. Psychology of Music, November 2015; vol. 43, 6: pp. 831-854., first published online August 15, 2014. Towards biophysiological and acoustic markers for perceived annoyance in response to reproduced environmental soundscapes. Duncan Williams, Adam Thomas, Charlotte Clark, and Damian Murphy. In Proc. of the 48th International Congress and Exhibition on Noise Control Engineering (INTER.NOISE), Madrid, Spain. 16-19th June, 2019. Multimodal measurement of listener responses to urban environmental soundscapes. Duncan Williams, Adam Thomas, Charlotte Clark, and Damian Murphy (Workshop conducted with project partners ARUP). Held at the Audio Engineering Society 2019 International Conference on Immersive and Interactive Audio (AESIIA), York, UK. 27th-29th March, 2019. AI and Automatic Music Generation for Mindfulness. Chia-Yu Wu, Duncan Williams, Victoria Hodge, Anders Drachen, Lina Gega, Peter Cowling, and Damian Murphy. In Proc. of the Audio Engineering Society 2019 International Conference on Immersive and Interactive Audio (AESIIA), York, UK. 27th-29th March, 2019. A Psychometric Evaluation of Emotional Responses to Horror Music. Duncan Williams, Chia-Yu Wu, Victoria Hodge, Peter Cowling, and Damian Murphy. In Proc. of the 146th Convention of the Audio Engineering Society (AES146), Dublin, Ireland. 20th-23rd March, 2019. Measuring biophysiological responses in The Deep. Duncan Williams and Deborah Cracknell. In Proc. of the 33rd European Union Conference of Aquarium Curators, EUAC, Hull UK. 15th - 18th October 2018. BCI for ensemble music making and performance: why and how (not how and why). Duncan Williams and Ian Daly. In Proc. of the Together in Music: Expression, Performance and Communication in Ensembles conference, National Centre for Early Music, York UK. 12th -14th April 2018. Towards bio-responsive control of music. D.A.H. Williams, D.T. Murphy, and B.M. Fazenda. In Proc. of 12th Digital Music Research Network Workshop (DMRN+12). Centre for Digital Music (C4DM), Queen Mary University of London, 19 December 2017. Evaluation strategies for large data sonification. D. Williams. In Proc. of 21st Int'l Conf. on Digital Research in the Humanities (DRHA). Arts Institute, Plymouth University, 10-13 September 2017. Audience participation through Digital Signal Processing for sound synthesis, composition and performance. P. E. Largeron, D. A. H. Williams, E. R. Miranda. 8th Int'l Conf. on Music/Sonic Art: Practices and Theories, "Sounds without Borders". Institut für Musikwissenschaft und Musikinformatik (IMWI), Karlsruhe, Germany. 6-9 July 2017. Approaches to Brain-Computer Music Interface Design. Miranda, E., Williams, D., 19th International Conference on Human-Computer Interaction, Vancouver, Canada. 9-14 July 2017. The Song Collectors Pathway. Williams, D., Song Collectors Gathering, St Marks Church, Dalston, London, 26 November 2016. Towards a Timbral Classifcation System for Musical Excerpts. Antoine, A., Williams, D., Miranda, E.R., in Proceedings of the 2nd AES Workshop on Intelligent Music Production, London, UK, 13 September 2016. Acoustic fingerprints from Trevor Jones’ Dark City found in Hans Zimmers’ Inception. Williams, D., Music for Audio-Visual Media Conference II, Leeds University, Leeds University, UK, 20-22 June 2016. An affective brain-computer music interface Daly, I., Williams, D., Kirke, A., Weaver, J., Malik, A., Hwang, F., Eaton, J., Miranda E.R., Nasuto, S.J., International Brain-Computer Interface (BCI) Meeting, California, USA, May 30–June 3 2016. Developing a timbrometer: perceptually-motivated audio signal metering. 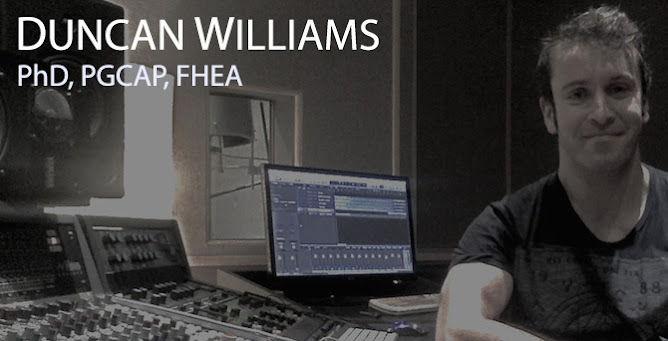 Williams, D., 139th Audio Engineering Society Convention (AES139). New York, NY, USA, October 29-31 2015. Multi-criteria decision aid analysis of a musification approach to the auditory display of micro-organism movement. Williams, D., Wilson, L.G., 139th Audio Engineering Society Convention (AES139). New York, NY, USA, October 29-31 2015. Affective potential in vocal production. Williams, D., 139th Audio Engineering Society Convention (AES139). New York, NY, USA, October 29-31 2015. Identifying music-induced emotions from EEG for use in brain-computer music interfacing. Daly, I., Williams, D., Hwang, F., Kirke, A., Malik, A., Roesch, E., Weaver, J., Miranda, E. R., Nasuto, S. J., 4th Workshop on Affective Brain-Computer Interfaces at the 6th International Conference on Affective Computing and Intelligent Interaction (ACII2015). Xi’an, China, 21-25 September 2015. Towards Human-Computer Music Interaction: Evaluation of an Affectively-Driven Music Generator Via Galvanic Skin Response Measures. Daly, I., Williams, D., Hwang, F., Kirke, A., Malik, A., Roesch, E., Weaver, J., Miranda, E. R., Nasuto, S. J., IEEE 7th Computer Science & Electronic Engineering Conference (CEEC’15). Exeter, UK, 24-25 September 2015. Evaluating the affective potential of a computer-aided composition system in 2-Dimensions. Williams, D., Kirke, A., Miranda, E. R., Off The Lip Transtechnology Conference, Plymouth, Devon UK, 9-11 September, 2015. Affective calibration of a computer aided composition system by listener evaluation. Williams, D., Kirke, A., Miranda, E. R., Daly, I., Hallowell, J., Hwang, F., Malik, A., Weaver, J., Nasuto, S. J., Ninth Triennial Conference of the European Society for the Cognitive Sciences of Music (ESCOM). Royal Northern College of Music, Manchester, UK, 17-22 August 2015. Evaluating apparatus for musification of P. berghei micro-organism motility with synchronous 3D holography. Williams, D., Wilson, L.G., 11th International Symposium on Computer Music Modelling and Retrieval (CMMR2015). Plymouth, Devon, UK. 16-19 June 2015. Towards emotionally driven music creation via a Brain-Computer Music Interface. Duncan Williams. BioMusic Symposium: Interfacing Brain, Music, and Emotions. Peninsula Arts Contemporary Music Festival, Plymouth, Devon, UK. 27 February 2015. Artificia for Neural Network and Piano (Williams, 2014). Conference paper + Recital, Williams. London International Piano Symposium, Royal College of Music, London UK, February 13-15 2015. Musification of ALS Pathophysiology: Notes on Timbre and Spatialisation in Unfolding | Clusters. Visi, F., Williams, D., Dothel, G., Miranda, E R. 9th Conference on Interdisciplinary Musicology (CIM-14). Staatliches Institut für Musikforschung (National Institute for Music Research), Berlin, Germany. December 4-6 2014. Unfolding Clusters: A music and visual media model of ALS pathophysiology. Federico Visi, Duncan Williams, Giovanni Dothel, Eduardo Miranda. Conference on Sonification of Health and Environmental Data (SoniHED). Centre for Chronic Diseases and Disorders, University of York, UK. 12th September 2014. Brain-computer music interfacing for continuous control of musical tempo. Daly, I., Williams, D., Hwang, F., Kirke, A., Malik, A., Roesch, E., Weaver, J., Miranda, E. R., Nasuto, S. J., 6th International Brain-Computer Interface Conference, Graz, Austria, September 16-19th, 2014. Evaluating perceptual separation in a pilot system for affective composition. Williams, D., Kirke, A., Miranda, E. R., Daly, I., Hallowell, J., Hwang, F., Malik, A., Roesch, E., Weaver, J., Nasuto, S. J., International Computer Music Conference / Sound and Music Computing Conference (ICMC/SMC2014). Athens, Greece, 15-19th September 2014. Affective Jukebox: A confirmatory study of EEG emotional correlates in response to musical stimuli. Eaton, J., Williams, D., Miranda, E. R., International Computer Music Conference / Sound and Music Computing Conference (ICMC/SMC2014). Athens, Greece, 15-19th September 2014. Changes in music tempo entrain movement related brain activity. Daly, I., Hallowell, J., Hwang, F., Kirke, A., Malik, A., Roesch, E., Weaver, J., Williams, D., Miranda, E. R., Nasuto, S. J. (2014, August). 36th Annual International Conference of the IEEE Engineering in Medicine and Biology Society (EMBC'14). Chicago, Illinois, USA. Timbre morphing: near real-time hybrid synthesis in a musical installation. Duncan Williams, Peter Randall-Page, Eduardo Miranda. New Interfaces for Musical Expression (NIME2014). Goldsmiths University of London, London, UK, 1st - 3rd July 2014. Brazilian Capoeirista and Thai Sarama: Ritual and form in the musical accompaniment of two seemingly disparate martial arts, (AAWM). Williams, D. Joint Annual Conference of the British Forum for Ethnomusicology (BFE 2014) and Third International Conference on Analytical Approaches to World Music (AAWM 2014). School of Oriental and Asian Studies (SOAS), University of London. London, UK, 1st – 4th July 2014. An Immersive Media Model of Amyotrophic Lateral Sclerosis (Motor Neurone Disease). Federico Visi, Giovanni Dothel, Duncan Williams and Eduardo Miranda. Electronic Visualisation and the Arts (EVA13), Electronic Workshops in Computing (eWiC) Electronic Visualisation and the Arts (EVA 2014), Chartered Institute for IT (BCS). London, UK, 8th - 10th July 2014. Towards Affective Algorithmic Composition. Duncan Williams, Alexis Kirke, Eduardo Reck Miranda, Etienne B. Roesch, Slawomir J. Nasuto. Proceedings of the 3rd International Conference on Music & Emotion (ICME3). Jyväskylä, Finland, June 11th - 15th, 2013. Geoff Luck & Olivier Brabant (Eds.). University of Jyväskylä, Department of Music. Evaluating Timbre in Location Recordings. Williams, D. Taylor Institute, Ashmolean Museum, Sound Day Workshop "Working with sound: language, music, and beyond". University of Oxford, UK, 5 March 2011. Prosoniq Morph, Formats: Mac & PC VST. TFPro P4: Dual Recording Channel. Sounding Off: Is entry-level software killing musical creativity? What are our bodies telling us about noise? South by SouthWest, Social and Global Impact Track (SXSW), Austin, Texas USA, 9 March 2019. Falling Walls Engage, Berlin 2018 (Berlin Science Festival). Finalist (science communication engagement award). Brandenburg Gate, Berlin, Germany, 8th-9th November 2018. Biophysiological signals as audio meters and control signals. 4th Workshop on Intelligent Music Production, Invited Keynote. Huddersfield University, UK, 14 September 2018. Relaxing with the fishes (Late night at The Deep). Duncan Williams, Deborah Cracknell, and Graham Hill. British Science Festival. BSA. Hull, UK, 13 September 2018. Welcome to the Bloom - Jellyfishin' VR. Duncan Williams, Lance Putnam, et al. York Festival of Ideas, York, UK. 5 - 17 June 2018. Repeated at York Mediale 2018, Continue: Videogames & Culture festival, York, UK, 27 September - 06 October 2018. How does sound influence our emotions whilst driving? Pint of Science, Invited lecture, York, UK, 15 May 2018. Music in Mind. Duncan Williams, TEDx Truro, "Beyond Barriers". Truro, Cornwall, UK, 27 October 2018. Neurophysiological and psychoacoustic perspectives for computational ethnomusicology. Computational Ethnomusicology: Methodologies for a New Field, Lorentz Center @ Oort, Leiden, Netherlands. 27-31 March, 2017. Institute of Physics, UK: Using Artificial Intelligence and BCI for Music Making. Invited guest lecture for Institute of Physics. The William Penney Theatre, AWE Recreational Society, AWE Aldermaston, Berkshire RG7 4PR. 13 June 2016. Applied Psychoacoustics Laboratory, Huddersfield University: Using Artificial Intelligence and BCI for Emotionally-Driven Music Creation. Invited guest lecture. Huddersfield University, UK. 20 June 2016. Mindfield: 6th Annual School of Psychology Conference. Invited Keynote: Music, Mind, and Affective States. Plymouth, UK. 12-13th June, 2014. Other: Composition, Recording, Performance etc.